Irrepressible Biddy Leigh, under-cook at forbidding Mawton Hall, only wants to marry her childhood sweetheart and set up her own tavern. But when her elderly master marries young Lady Carinna, Biddy is unwittingly swept up in a world of scheming, secrets, and lies. Forced to accompany her new mistress to Italy, she documents her adventures and culinary discoveries in an old household book of recipes, The Cook’s Jewel. Biddy grows intrigued by her fellow travelers, but her secretive and unconventional mistress is the most intriguing of all. In London, Biddy finds herself attracted to her mistress’s younger brother. In France, she discovers her mistress’s dark secret. At last in Italy, Biddy becomes embroiled in a murderous conspiracy, knowing the secrets she holds could be a key to a better life, or her downfall. 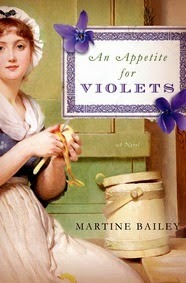 Don't let the cover of AN APPETITE FOR VIOLETS by Martine Bailey fool you! Initially I thought this book looked like a sweet piece of historical fiction, but upon further review, I think this sounds like one juicy novel. There are secrets, obsessions and betrayals -- I can't wait to read it! In the meantime, I am so excited that the fine folks at St. Martin's Press are sponsoring a giveaway for one copy of AN APPETITE FOR VIOLETS. To enter, just fill out the form below before February 11th at 11:59 p.m. EST. I will randomly select and notify the winner the following day. This contest is open to those of you with U.S. addresses only. Good luck! I bet my mom would love this! Great giveaway. I have a copy already and have been looking forward to it. I've seen this one around a lot lately and everytime I think....must.read.this!